NEW YORK -- The Charlotte Hornets scored 41 points in the second quarter and went on wallop the New York Knicks, 110-82, on Saturday afternoon at Madison Square Garden. 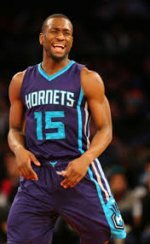 Kemba Walker scored 28 points in 28 minutes to lead the Hornets while P.J. Hairston had 15. Bismack Biyombo and Brian Roberts finished 14 apiece for Charlotte, which converted half of their field goals, 39 of 78. "He's played at a high level all year and now he's shooting the ball better. He sets the tone at both ends," Hornets head coach Steve Clifford said at his post-game press conference. The Hornets have now won five straight, four of them were without starters Al Jefferson and Lance Stephenson. The Knicks. meanwhile, dropped their 15th in a row, the longest losing streak in franchise history. Quincy Acy led New York with 18 points while Tim Hardaway Jr. added 15. Shane Larkin had 12 points off the bench but the of the Knicks struggled, most especially veteran Jose Calderon, who missed nine of 12 shots. "They have to continue to learn, and we all have to continue to learn that it's not easy to win in this league. We're obviously finding out the hard way," Derek Fisher said after the game. Photo: Kemba Walker was too hot to handle for the Knicks, who lost to the Charlotte Hornets, 110-82, at the Madison Square Garden. Click here to view a list of other articles written by Ben Paz.